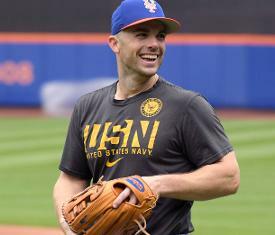 The New York Mets will activate third baseman David Wright from the disabled list on Sept. 25, and he will start what he expects to be his final major league game on Sept. 29. The announcement was made at a press conference on Thursday. "It's truly been an honor to take the field with you, and serve as your captain," an emotional Wright said. "To the fans, words can't address my gratitude." The Sept. 29 contest against the Miami Marlins is the Mets' second-to-last game of the season. Sept. 25 marks the beginning of their final homestand. If Wright does retire at season's end, he will leave $27 million on the table between the last two seasons of his eight-year, $138 million contract. However, both Wright and Mets chief operating officer Jeff Wilpon refrained from using the word "retirement" when discussing the end of his playing career Thursday. Wright's scheduled return date marks the end of a long road back to the major leagues for the seven-time All-Star. The 35-year-old last played in the majors on May 27, 2016, as he has been sidelined by back, shoulder and neck issues related to the spinal stenosis he has suffered from for many years. Wright began a minor league rehab assignment with high Class-A St. Lucie on Aug. 12 and was promoted to Triple-A Las Vegas on Aug. 28. In 12 games between the affiliates, two coming at Las Vegas, Wright hit .171 (7-for-41) with two RBIs. "When I really started ramping up baseball stuff ... when I woke up in the mornings, something is always a concern," Wright said. "Whether it's my back, my neck, my shoulder, some days that pain in any one of those three areas, or all three of the areas, can be moderate and manageable. And there are some days where it was too painful to think about baseball." Wright is a career .296 hitter in the majors, with 242 home runs and 970 RBIs. He earned $20 million this season, a portion of which the Mets have recouped via insurance while he's been on the disabled list.